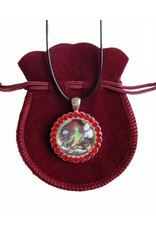 Necklace "Green Tara" of Tibetan Buddhist Art. 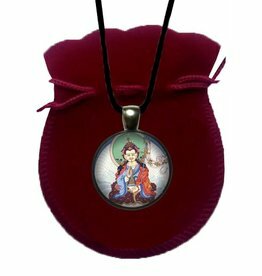 These original necklaces are based on Thangka paintings by Carmen Mensink. 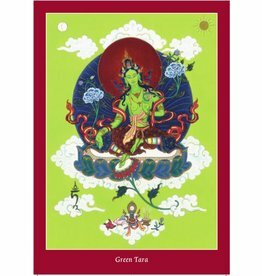 Green Tara is the Bodhisattva of Salvation or The Mother of all Buddhas (Tib. : Dolma, Drolma). Green Tara, the female manifestation of active compassion, reaches out her hand to grant all wishes and, with her right foot outstretched, she is ready to step down and help all who call upon her. 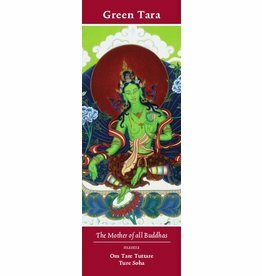 Tara is one of the most revered deities in Tibetan Buddhism and there are numerous stories of people that were saved from fears and difficulties while calling her name or reciting her mantra. Tara, born as a princess called Yeshe Dawa, reached bodhicitta as the result of her untiring practice. One can say that she was one of the first emancipated women. When other - male - practitioners told her to pray for reincarnation in a male body in order to reach enlightenment, she made the following strong vow: "Until Samsara is empty, I shall work for the benefit of all sentient beings in a woman's body." By mastering extremely profound states of meditation she developed great skills in liberating others and therefore she is also called The Swift liberator. 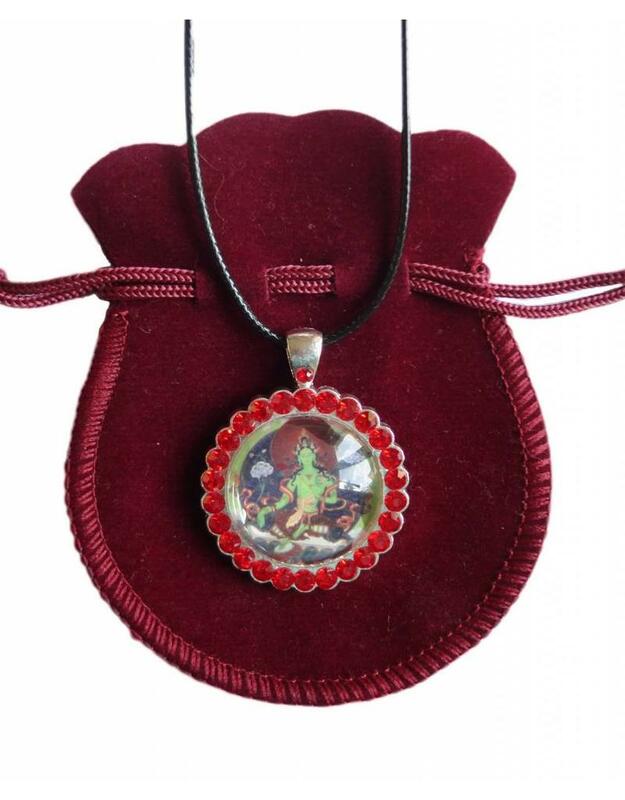 The pendant is made of metal with red rhinestones on a wax cord and the clasp is made of metal. The length of the necklace is 42 cm (extendable to 46 cm) and the pendant is 3.4 cm x 3.4 cm x 0.8 cm. The necklaces will be delivered in a dark red velvet bag. This necklace is a design of Tibetan Buddhist Art - Copyright: © Carmen Mensink.